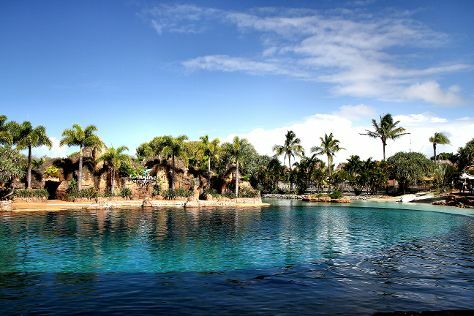 Attractions like Sea World Theme Park and Warner Bros. Movie World make great kid-friendly stops. And it doesn't end there: find something for the whole family at Dreamworld, meet the residents at Currumbin Wildlife Sanctuary, look for gifts at Miami Marketta, and enjoy the sand and surf at Surfer's Paradise Beach. To see ratings, more things to do, photos, and other tourist information, refer to the Gold Coast trip planner . Melbourne to Gold Coast is an approximately 4.5-hour flight. You can also do a combination of flight and train; or drive. Plan for a bit warmer temperatures traveling from Melbourne in April, with highs in Gold Coast at 30°C and lows at 19°C. Cap off your sightseeing on the 12th (Fri) early enough to travel to Port Douglas. Family-friendly places like Scuba & Snorkeling and Palm Cove Beach will thrill your kids. You'll find plenty of places to visit near Port Douglas: Trinity Beach (in Trinity Beach), Cow Bay Beach (in Cow Bay) and Cairns (Esplanade Boardwalk & Esplanade Lagoon Pool). Spend the 15th (Mon) spotting exotic species with a safari tour. Spend the 20th (Sat) exploring nature at Daintree National Park. And it doesn't end there: relax in the rural setting at Hartley's Crocodile Adventures, look for gifts at The Reef Marina, get outside with Port Douglas Microlights, and kick back and relax at Myall Beach. Do a combination of flight and shuttle from Gold Coast to Port Douglas in 6.5 hours. Alternatively, you can do a combination of train, flight, and shuttle; or drive. Plan for a bit warmer temperatures traveling from Gold Coast in April, with highs in Port Douglas at 34°C and lows at 25°C. Finish your sightseeing early on the 21st (Sun) so you can travel back home.